All songs by Donovan P. Leitch, except 02 by Bert Jansch, 04 by Buffy Sainte-Marie and 10 by Mick Softley. 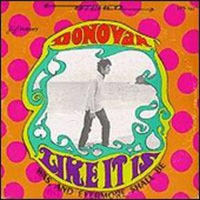 · In order to attract sales, Hickory chose a colourful cover, to match with Donovan's newest releases on Epic Records by that time, such as the Sunshine Superman album. · On the back cover there are two letter from fans. One of them from a young girl, and the other from a middle-aged businessman who thanks Donovan for the way one of his songs led him to reconsider life. · This compilation contained Why Do You Treat Me Like You Do and Donovan's recording of Bert Jansch's Do You Hear Me Now, neither of which had been included on any of Donovan's LP released in the USA. · Hey Gyp (Dig The Slowness) is listed as Hey Gyp. · Sunny Goodge Street is listed as Sunny Goodge St.